Occasional Tuesday tweet: Wren on the rose, Bewick’s or Carolina? I’ve been calling these guys Bewick’s wrens (Thryomanes bewickii) for a couple of years, based on an identification I made a couple of years ago — but checking today to be sure, I’m thinking this is a Carolina wren (Thryothorus ludovicianus) instead. In any case, a couple of days ago it paused for a few minutes in our backyard rose arbor, long enough I could try to get a good shot with just a 200mm telephoto, and with colors dulled by the window. Wrens stick around all winter now; they didn’t just over a decade ago. This family has been with us for at least three years — two young this year successfully fledged. By now it’s almost impossible to tell which are the young, which the parents. On our patio we have a saga continuing with Gulf fritillary butterflies (Agraulis vanillae), their larva, and passion vine. It seems our neighbors eradicated passion vine, so when the frits start moving north in the spring, they find our passion vines as the only ones in town. The females go nuts laying eggs, and at some point we have a surplus of larva who denude the vines in a week. Late hatching larva probably die off. The butterfly books suggest that we cull the larva, but we don’t have the heart. At some point in the spring the wrens wake up to the issue, and they cull the larva for us. The vines recover, a new wave of frits hatch out, and the cycle begins again. From June through September, the passion vine loses any leaves it puts out within 48 hours, usually. But the wrens probably eat well. The wrens seem never to perch where we can see them when they sing. I suspect these little guys of having a much better voice than most wrens, but the great arpeggios I hear may be another bird, perhaps a warbler, that I just don’t know (good reason to go spend time at the local Dogwood Canyon Audubon Center, yes?). This entry was posted on Tuesday, January 22nd, 2013 at 1:02 pm and is filed under Bird Watching, Gardening, Ornithology, Outdoor Recreation, Wildlife. You can follow any responses to this entry through the RSS 2.0 feed. You can leave a response, or trackback from your own site. 5 Responses to Occasional Tuesday tweet: Wren on the rose, Bewick’s or Carolina? 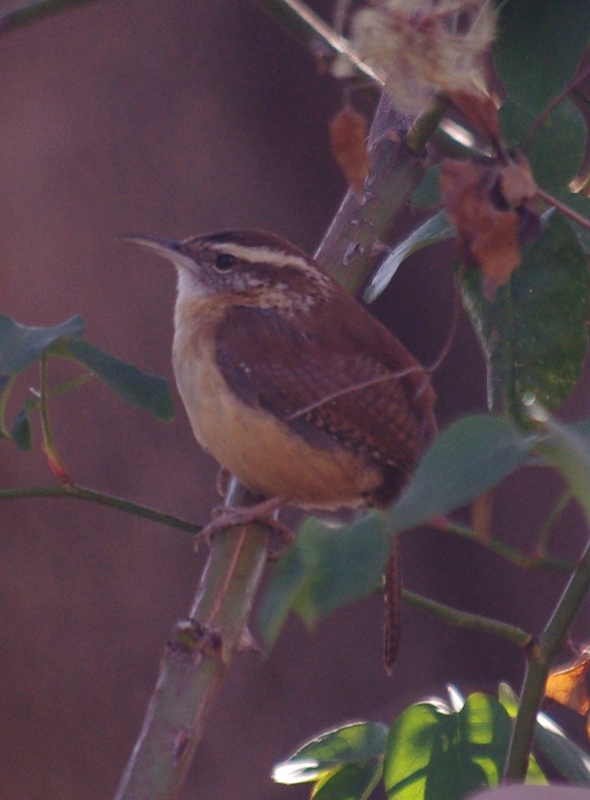 I’d say it’s a Carolina Wren too. I’ll send this to a Bird Guru I know and have him cast a vote.